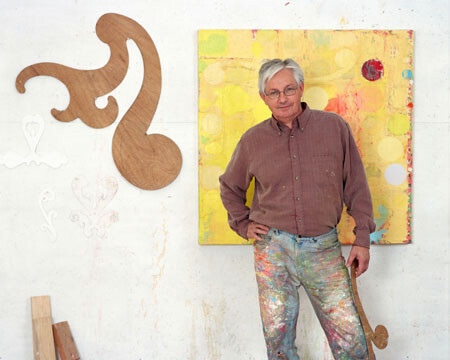 Joseph Piasentin is a professor of painting and drawing at Pepperdine University. It has been said that Piasentin encourages his students to be responsible for every choice, every decision made as a painter. His own work – abstract expressionism – evolved at a time when the genre had been in and out of fashion, challenged by Pop Art and a return to realism. His paintings are private and personal, revealing themselves over time. The earlier works are confrontational, unsentimental explorations of memory that examine his life. The large canvasses employ corrugated cardboard, bird wire, rice paper and other, at times unexpected, objects. Constructing slowly and carefully, over time, Piasentin creates works that are arresting, inviting the viewer to examine and question his own and the artist’s feelings. A stay in Costa Rica in 1998 had a great impact on the artist. From that time he began using different images and color choices and his work has become more accessible. Joseph Piasentin’s documentation took place in 2004 and was sponsored by Dr. Richard Gould. The FOTM Archive contains extensive information about this artist.